Hope Lutheran was begun in 1951 by Rev. Carl Baase as a Mission of Mount Calvary Lutheran Church, New Westminster, BC. Worship services and Sunday School were first held in the Garden Hill Funeral Chapel on Central Avenue. Sunday School pupils were seated just a “sheer” curtain away from the casket display. The pews were rows of chairs placed very close together. A crying or fidgety child was passed to the end of the row and the last person would take them outside. As the mission continued to grow it was decided to purchase 1.067 acres on York Street on September 12th, 1955 for the site of a church building. The cost of the new property was $4,000 and included a three room house which served as the parsonage. 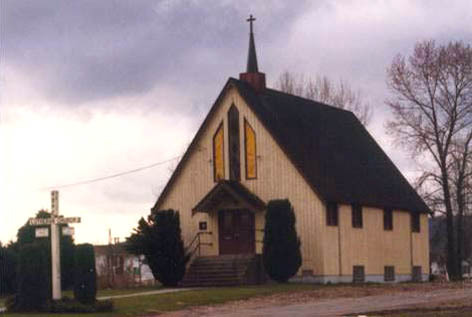 On September 27th, 1955, the Lutheran Mission at Port Coquitlam was organized as a congregation of the Alberta-British Columbia (A-BC) District of the Lutheran Church-Missouri Synod under the name of Hope Lutheran Church. (With the formation of Lutheran Church Canada in 1988, the congregation joined the LCC fellowship rather than the United States-based Missouri Synod.) Nineteen charter members (men) signed the first constitution. The contract to build the first church was awarded May 18th, 1956. The building cost of $18,000 was borrowed from A-BC District Church Extension Fund and the voting members (men only) were very concerned about the large mortgage. The church was dedicated October 11th, 1956. In June of 1976 a pipe organ was ordered from Mr. Hugo Spilker of Victoria, B.C. and installed at a cost of $6,228.00. In December that year an adjoining half acre north of the church property was purchased for $45,000 with a loan from the District Church Extension Fund. 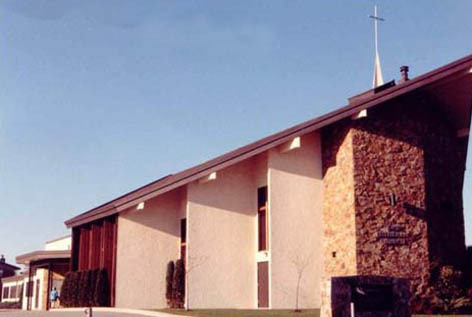 At a voters’ meeting April 9th, 1978 it was decided that the congregation had outgrown its facilities and in order to continue effective outreach with the Gospel of Jesus Christ to the community it would be necessary to build a new church. A loan of $350,000.00 was applied for and granted from the A-BC District Extension Fund. Two months later, in June of 1978, the parsonage was sold for $55,000.00 and the pastor was paid a living allowance in addition to salary. In 1979 the ladies of Hope joined the Lutheran Women’s Missionary League. LWML continues to be an active ministry of the congregation today. Among other things, the group organizes congregational dinners and funeral teas, mite box and eye glass collections for missions, and supporting seminary students. LWML meets the first Monday of the month for Bible Study and a business meeting and LWML Sunday is celebrated annually during a worship service in October. A Groundbreaking Ceremony for Hope’s new church building was held February 3rd, 1980 and construction began immediately. The cornerstone was removed from the old church, engraved with ‘1980’ beside the ‘1956’ date and placed in a special Cornerstone Laying Ceremony at the new church on June 1st, 1980. (While the cornerstone was originally outside the church adjacent to the entrance doors, following renovations in1998 the cornerstone is now on the stone wall inside the narthex.) The church facility was dedicated August 10th, 1980. On Thursday, April 16th, 1981 the members of Hope were horrified to find that an arsonist had set fire to the church and approximately $350,000.00 worth of damage was done. The safe was robbed of $20.00 and the narthex, the pastor’s and secretary’s offices were destroyed. The rest of the building suffered severe heat, smoke and water damage. Thankfully, the congregation had purchased ‘replacement cost’ insurance just six weeks prior. 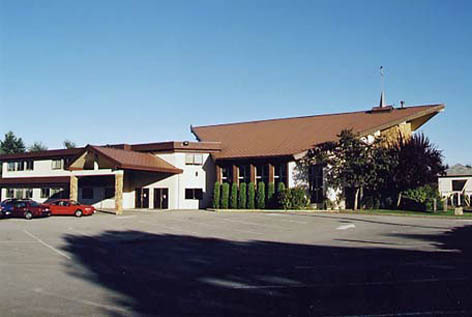 Beginning Easter Sunday April 19th, 1981 and throughout the rebuilding process church services were held at Viscount Elementary School–presently the site of Kwayhquitlam Middle School. The church building officially re-opened September 13th, 1981. After some experimentation with more contemporary liturgical worship, in 1993 the congregation decided to establish two separate worship services on a regular basis; one traditional and the other more contemporary. In 1995 an exploratory committee recommended to the voter’s assembly that the congregation begin a Lutheran parochial school as one of the best means to reach the community with the Gospel. The voters approved the proposal on April 23rd, 1995. After a great deal of dedication and hard work the school opened in September, 1995 with eight Kindergarten students. In 1996 a full time teacher/principal was hired. The school now accommodated Kindergarten and Grade One. Enrollment rose to 45 students in 1997 and a half-time teacher for Kindergarten and full time teacher for grades 2-4 were added to the staff. The student population continued to grow and required more space. 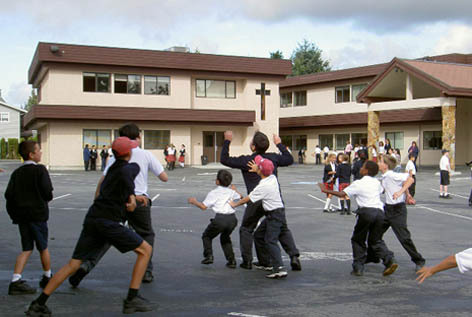 After a number of planning meetings, at a special voters meeting in May, 1998, plans for new education wings, narthex and office expansion were approved, costs to be covered by a loan of $560,000.00 from A-BC District Church Extension Fund. The Ground Breaking Ceremony for the school expansion way held May 24th, 1998 and dedication of the new facility took place October 18th, 1998. It became very apparent that more space would soon be needed. In 2000 the congregation decided to convert the church balcony into a library so that the space gained could be used for an additional classroom. The school continued to experience such tremendous growth that in 2002 two classes began walking two blocks from the school to rented facilities at another local church. Thus, another ground breaking ceremony was held October 22, 2002 for a second building, adjacent to the main building, for 4 new classrooms. The A-BC District Church Extension Fund again granted a loan of approximately $500,000.00 for construction. The building was completed in May 2003 with a dedication service held September 28, 2003. The tree of gratitude so prominently displayed in our narthex is a symbol of thanks and gratitude to God for the many blessings he has given us all in our lives. The tree recognizes and thanks all those who have provided and continue to provide their financial support toward Hope Lutheran School, an important mission in our congregation and community. The school continues to grow with over 230 students in Kindergarten to Grade 10. Beginning fall 2012 the main campus became home for grades K-7 and Hope High, grades 8-11, moved on site at Riverside Community Church in Port Coquitlam. Grade 12 was then added the fall of 2013, with the spring of 2014 seeing Hope Lutheran Christian School celebrate it’s first graduating class! From the beginning God has richly blessed the mission outreach in our school with gifted and dedicated administrative and teaching staff and support staff. Today, Hope Lutheran congregation has some 550 baptized and over 400 confirmed members. We are deeply grateful to God for His overwhelming goodness and faithfulness toward us. We are also confident that He will continue to bless the work of His kingdom through Hope Lutheran.